Darjeeling Bannockburn estate situated at 6000ft in the Himalayas with Everest in view. The best of the best. Darjeeling Tea has a unique and refreshing taste, a real treat. Known to many as the "Champagne of teas" Loose Leaf Darjeeling Tea is one of the most famous teas in the world, and for good reason. Grown high in the foothills of the Himalayas at the Bannockburn estate, One of the oldest of the 87 estates and considered to be one of the best kept gardens in Darjeeling, it really is the best of the best being handpicked from 6000ft in the Himalayas. Two trees were planted in the Tea Estate managers garden in honour of Oscar and Annie visiting this esteemed Bannockburn estate. 100% Fairtrade, Organic, Rainforest Alliance Certified Indian Darjeeling loose leaf tea from the Bannockburn region. Use freshly drawn boiled water & allow to cool slightly (70-80degree) before brewing. Infuse one tea measure per pot and brew for 2-5 minutes to your taste… enjoy! 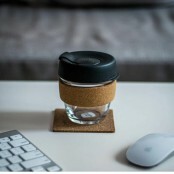 Product : Excellent, makes lovely strong cup of tea when used with a diffuser. Service rating : First Class Service every time. I live in NE Florida, I order on Monday morning EST = the afternoon GMT. 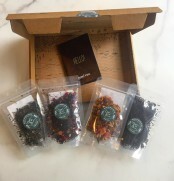 My tea arrives on Thursday - of the same week! Staff are always charming & very helpful on the phone. I now send Tea presents all over Europe & the USA & everyone loves it. ... Service rating : First Class Service every time. I live in NE Florida, I order on Monday morning EST = the afternoon GMT. My tea arrives on Thursday - of the same week! Staff are always charming & very helpful on the phone. I now send Tea presents all over Europe & the USA & everyone loves it. They use DHL so the package has to be signed for, not a bad thing in this day & age. The tea is wonderful all across the flavours & varieties. Teapots & mini milk bottles have all arrived in one piece. I gave a lot of tea as presents at Christmas & I am now reordering more as birthday presents. Can't say better than that. A very satisfied customer. Product : Love this tea. A bit more gutsy than my usual Darjeeling, which I was hoping for & I love. Very smooth & very delicious. Easy to order on line. Lovely website. Fast delivery. Email updates on order progress very helpful. Service rating : Fantastic smooth ordering, very quick delivery and well packed. Product : Love darjeeling tea and this one tops them all so far. So lovely to have a range of teas which taste as tea used to taste... before the mass market tea bags took over. Great teas, service fine, shame the price has to be so high, but I guess quality has to be paid for. Delighted I finally got round to ordering a box. Very prompt response! Good teas which I can blend at home.